I’m about to write about the throttle on a motorcycle, and you’re probably thinking, “What’s there to write about? You twist it to make you go, then you shut it off to slow to a stop.” Fundamentally, that’s what a throttle is designed for. When you use it, you’re accelerating. When you don’t, you’re decelerating. More or less, that’s what it does. 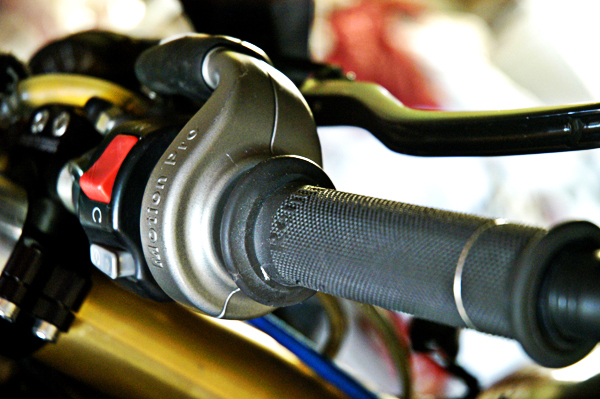 But as you can probably guess by now in the world of motorcycles and sport riding, the throttle is about as simple, yet versatile as the front brake. I’ll admit. This is probably my favorite tool out on the track. A motorcycle’s forward momentum is what keeps it stable and stops it from falling over. Think of a coin – if you try and stand it on its side, it will probably fall over, but if you roll it off your finger, it will roll upright and continue to do so until it loses enough forward momentum. The same principle applies to a moving motorcycle. Remembering this fundamental principle can serve you well as you understand how your throttle can help you during cornering. Forward momentum, or acceleration, keeps your bike upright. When steering a moving motorcycle, you are actuallyfighting the natural tendency of your motorcycle to remain upright as it travels forward. Though you are leaning the bike further to its side, its greater forward momentum prevents the motorcycle from falling over. As well, when you have applied the necessary lean angle for the corner, you then apply some throttle to maintain that lean angle, especially for long, sweeping corners. This is something that I like to call “throttle stabilization” – you are not necessarily accelerating, but rather maintaining your speed to keep the bike stable throughout the long corner. The throttle can also be used to steer the motorcycle, a technique that’s aptly called throttle steering. 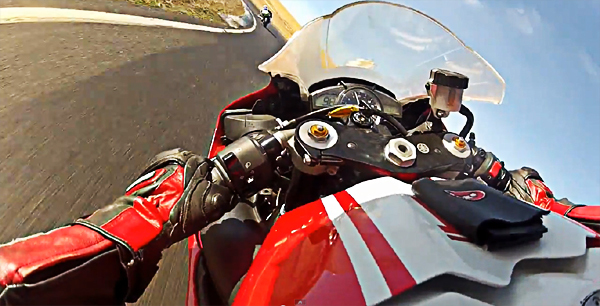 The onboard screenshot above is into Turn 8 of Thunderhill Raceway. Personally, I love that corner – it’s simply a no-holds barred corner that can actually be taken blindingly quick though it doesn’t look like it. Take note of a number of things in the photo – my right hand is twisting the throttle, and the speedometer already reads 98mph, all well before I’ve even hit the apex of that corner. Yes, it’s safe to assume that I am accelerating through that corner, but simultaneously, I am also steering my motorcycle with my throttle. See, I have a very good idea of how quickly one can go through this corner, and how much track is available during the exit of the corner. I also know the Turn 9 is another uphill left-hand corner following this one. So I set my entry into Turn 8 to allow me to get on the gas as soon as I possibly can before I even apex it. What this allows me to do is to dictate my trajectory by the application of my throttle – though I am turning the motorcycle left with the handlebars, continuously rolling on the throttle will ensure that I drift wide during the corner exit to find myself on the far right of the track, which is where I want to be anyway to set up for Turn 9. The positive acceleration that I was able to build up early on helps me during the slight uphill climb into Turn 9 as well. Building momentum AND steering simultaneously with the throttle. Don’t you just love multi-function tools? I appreciate all of the words that you had to share here in regards to throttle stabilization and steering! It has always been one of my dreams to own one of these motorcycles and be able to lean like this. It is interesting to learn that once you get good enough, you will be able to accelerate through the corners while steering with your throttle. Thanks for all the help!